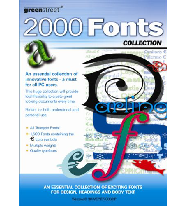 An essential collection of the most widely used fonts and a must for all PC users. This collection is perfect for both personal and office use. This brilliant collection includes:1000 Professional Fonts, 500 Fantastic Fonts and 500 Elegant Fonts. This websites set in Autumn. Users can choose any one of the conventional fonts from the 1,000 Professional Fonts selection to use in letterheads, business cards and newsletters. 500 Fantastic Fonts can be used for posters and greeting cards, while one of the 500 Elegant Fonts can be used to produce invitations and flyers.